These economy tipping skip forklift attachments are made from 3mm plate steel, reinforced with an angle top, and are a convenient and easy means of transferring waste and materials. The base has either a 4-way entry or 2-way entry (suitable for castors). Features include tip handle, self return and automatic reset mechanism, and a safety retaining chain. With a capacity of between 1400kg and 2000kg, these economy tipping skip forklift attachments are extremely capable of high levels of performance and that comes at an easily affordable cost. Yellow tipping skips will be supplied as standard but blue and green ones are also available; give our Sales team a call on 01332 821200 for more information. 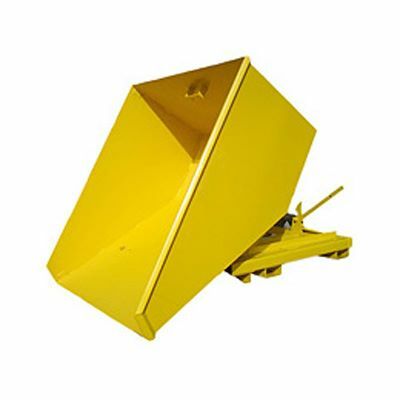 Optional tipping skip accessories, such as mesh height increase and steel lids are also available.